Every meal is a story we want to celebrate. Loyal diners who keep reserving with Chope will go up membership tiers and see their benefits multiply! From more Chope-Dollars per booking to exciting rewards up for redemption, there are plenty of reasons to reserve and dine. What are Chope-Dollars and how do I get them? Chope-Dollars are our way of rewarding diners for reserving with Chope. Simply reserve via www.chope.co or the Chope app, and receive at least 100 Chope-Dollars for every completed booking. Keep making reservations to move up tiers and earn more Chope-Dollars. What can I do with Chope-Dollars? Redeem them for cash vouchers at exclusive restaurants plus other rewards. Don’t have an account yet? Sign up for free and earn 100 Chope-Dollars immediately! The 100 Chope-Dollars will be credited within 72 hours of your account activation. Loyal diners will move up tiers as they keep booking. Reach higher tiers for better earnings! Refer to Table 1. below for details on each tier. Make and complete your Chope reservations* to increase your status and Chope-Dollars earnings! How do I move up tiers? You will move up to the next tier immediately after fulfilling X number of reservations* needed to level up. Why did I move down tiers? You will move down tiers if, at the end of the calendar year, you have not managed to fulfil X number of reservations* needed to maintain your current tier. The tier you will end up with depends on the number of reservations you made within that calendar year. Does my number of reservations reset every year? How would that affect my tier? The counter for reservations fulfilled will restart at the start of the year. Which tier you then start with depends on the number of reservations* fulfilled in the previous year. The bar shows your progress and the number of reservations needed to maintain the current tier for next year. Do my reservations in a different Chope city count towards my membership status? If you registered for a Chope account in Singapore, Hong Kong, Jakarta, Bali, Bangkok, or Phuket, your reservations in any of these cities will count towards your membership status. If you registered for a Chope account in Shanghai and Beijing, only your reservations in these cities will count towards your membership status. Looking for a summary of your Chope-Dollars and rewards? Access it easily on your app. When will I see my Chope-Dollars in my account? Put your current Chope-Dollars to good use before they expire at the end of 2019. Redeem them for attractive rewards! 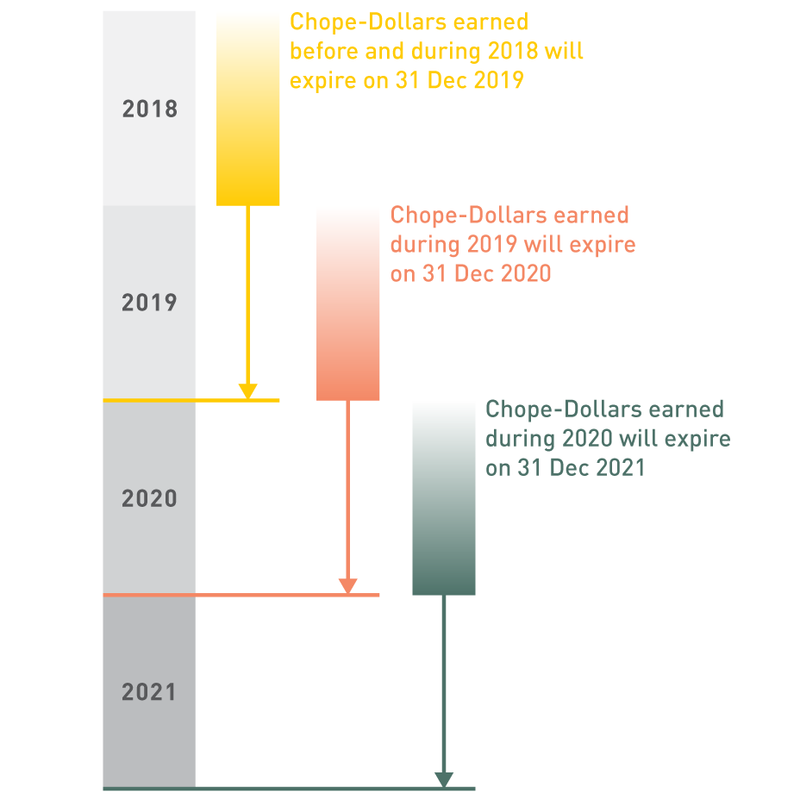 Will I be able to extend my Chope-Dollars' expiration date? Unfortunately, no. The expiration date of Chope-Dollars will not be extended for anyone, under any circumstances. The higher you go, the more your Chope-Dollars multiplier! Bigger multipliers lead to faster Chope-Dollars earnings. Table 2. below provides the multipliers for each tier, as well as an example of how a Chope-Dollars promo code would work. All users will earn a base amount of 100 Chope-Dollars per reservation when they first start booking with Chope. 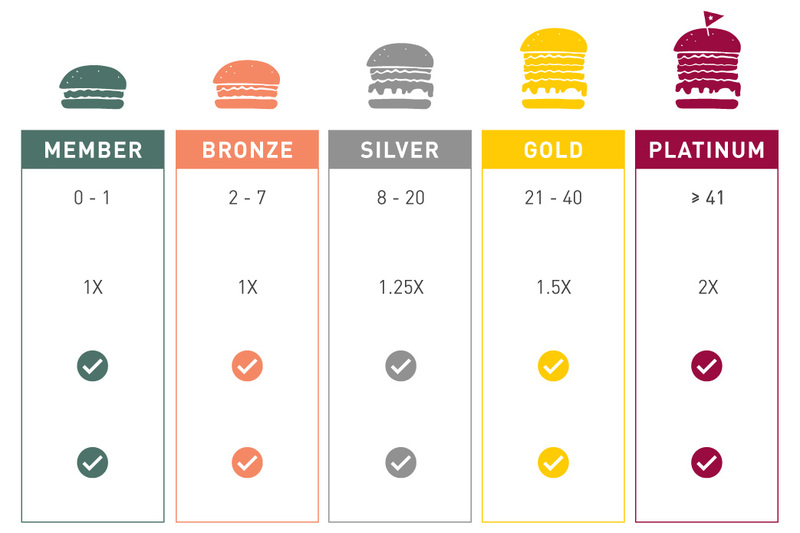 As you go up the tiers, the multiplier will kick in to give you more Chope-Dollars for each reservation*. The higher your tier, the higher your multiplier. For example, if your tier jumps from Silver to Gold and your multiplier increases from 1.25 to 1.5x, every reservation you make as a Gold user will give you 150 C$ (1.5 x 100 C$) compared to 125 C$ as a Silver user. Does the multiplier also work on promo codes? No, it does not. The multiplier only applies to the base amount of Chope-Dollars earned per reservation (100 C$) and not any other Chope-Dollar promotions or specials. Please refer to Table 2. above for an example of how it would work. Will my membership status and Chope-Dollars multiplier change if I use Chope in a different city? Your membership tier, requirements, and multiplier are tied to the city you registered in. If you registered in Chope Singapore, Hong Kong, Bangkok, Bali, Jakarta, or Phuket, your status and multiplier will not change for reservations made in those cities. How do I redeem my Chope-Dollars for rewards? Chope-Dollars can be used to redeem rewards from Chope Singapore, Chope Hong Kong, Chope Jakarta, Chope Bali, Chope Phuket and Chope Bangkok. Register as a verified user or login to Chope via Facebook (sign-up here). Fill in and submit the redemption form. Your Chope-Dollars will be automatically deducted upon submission of the redemption form. Your restaurant dining vouchers/discount code will be emailed to you instantly. For KrisFlyer redemption, KrisFlyer miles will be credited to the diner's KrisFlyer account within 15 days. For more information about Chope Shanghai rewards and redemptions, please email support.th@chope.co for assistance. Where do I view the rewards options? To view your options, please go to your Chope app profile page. Chope reserves the right to vary these terms and conditions without prior notice, without liability to any party.